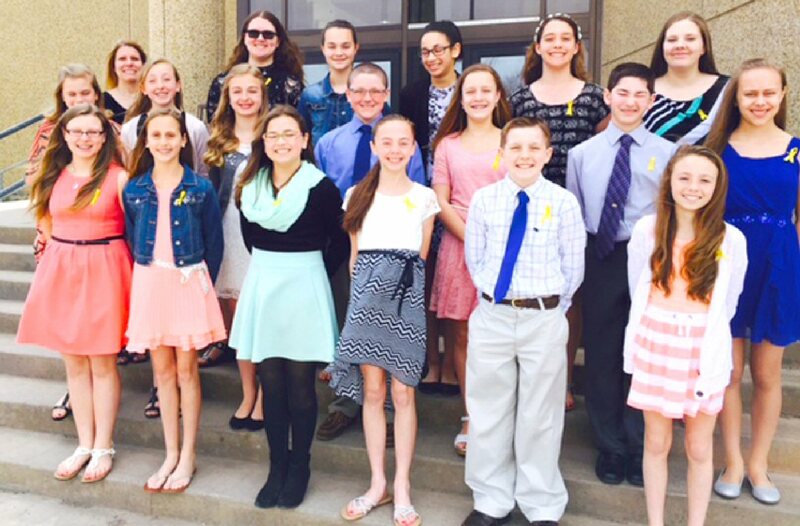 OSWEGO, NY –The Oswego Middle School National Junior Honor Society 2015 induction ceremony was held April 26 at the Ralph M. Faust Theatre in Oswego High School. The OMS National Junior Honor Society induction ceremony was held April 26. Outside following the event are: first row: Marissa Bell, Katie Fierro, Grace Hoffman, Molly Fitzgibbons, Jake Chetney and Sophie DeLorenzo. Second row: Hannah Holland, Gracie Cary, Abigail Chamberlain, Carson Colucci, Julia Roman, Josh Sterio and Kirsten Bell. Third row: National Junior Honor Society co-advisor Susan Roik, Paige Sawyer, Nicole DelConte, Victoria Tripp, Abigail Yurkon and Hailey Furlong. Eighteen students were inducted, according to Oswego Middle School Principal Mary Beth Fierro, who emceed the ceremony. The National Junior Honor Society is the nation’s premier organization established to recognize outstanding middle level students. More than just an honor roll, NJHS serves to honor those students who have demonstrated excellence in the areas of scholarship, leadership, service, citizenship and character. These characteristics have been associated with membership in the organization since its beginning in 1929.